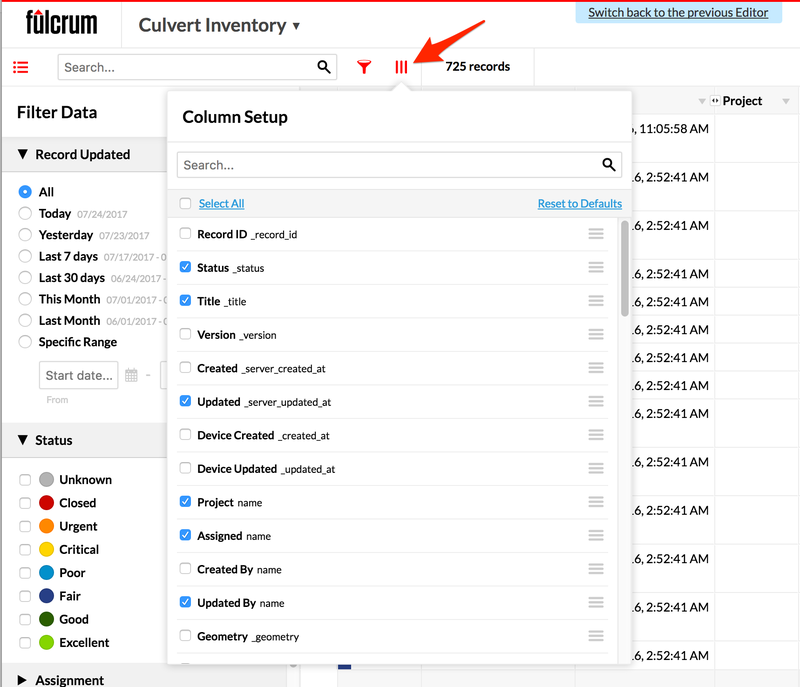 To the right of the custom filter icon on the record editor of the Fulcrum web app, you will see the column setup button (three horizontal red lines). This button will open the column setup window where you can select to display or hide columns. The columns can also be rearranged as needed by clicking and dragging the columns using the icon to the far right of the column name inside the column setup popup. Once you have setup the columns, you can run an export using the Download Data button in the upper-right corner of the record editor. The produced data file will, for the most part (see note below), only contain the columns that are visible in the data table. There are a few columns that are deemed to be critical, the record ID columns, the geometry, and the Latitude and Longitude columns. Since these are necessary columns for the importer, they are always included in the export data file and cannot be suppressed from the downloaded data file by using the column setup.